I recently posted an old photograph of a brush-maker that my daughter gave me for Christmas, and mentioned having a small collection of vintage, shaving-related ads and prints. Ravi suggested sharing some of them here. I've only got around to scanning or photographing a few so far, but I'll put up what I have. 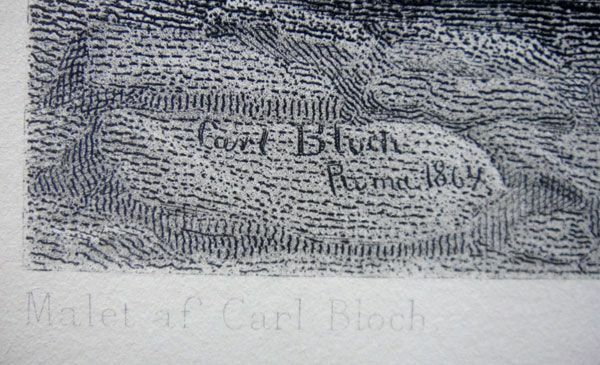 First below is a woodblock print made after a painting by Frederick Barnard. 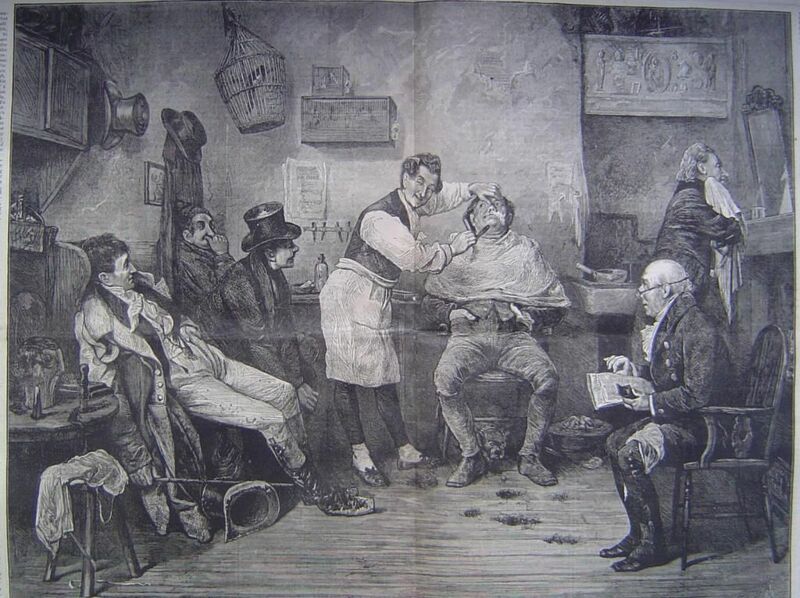 It depicts a barbershop in London circa 1825. The print was published in an 1875 issue of Harper's Weekly. It measures approximately 16" x 12.5" and is wonderfully detailed. I have two original copies of the full, folded page. I haven't yet been able to find an image of the painting itself. Here's a photo of the accompanying text. It seems some things haven't changed much in the intervening years ..
That's awesome. I love the fact that I'm looking at a nearly 200 year old work of art on a smartphone while sitting at a restaurant. We live in such an amazing combination of the old and the new. It's like making old-school shaving brushes on a computerized CNC machine using high tech petroleum based composite materials. Just an amazing confluence of the old and the new. Here's another. 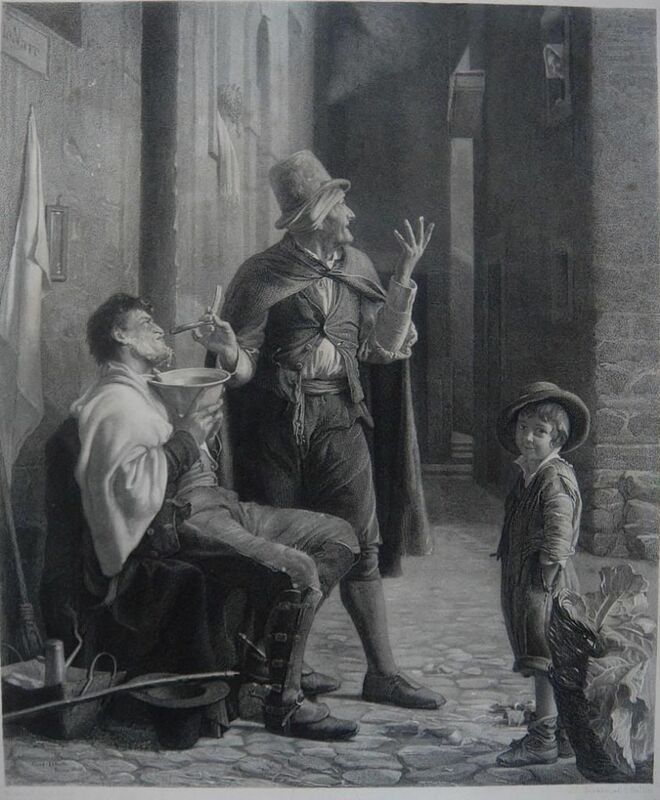 This is a steel engraving by Joel Ballin (1822-1885) after a painting by Carl Heinrich Bloch titled The Street Barber (Rome 1864). 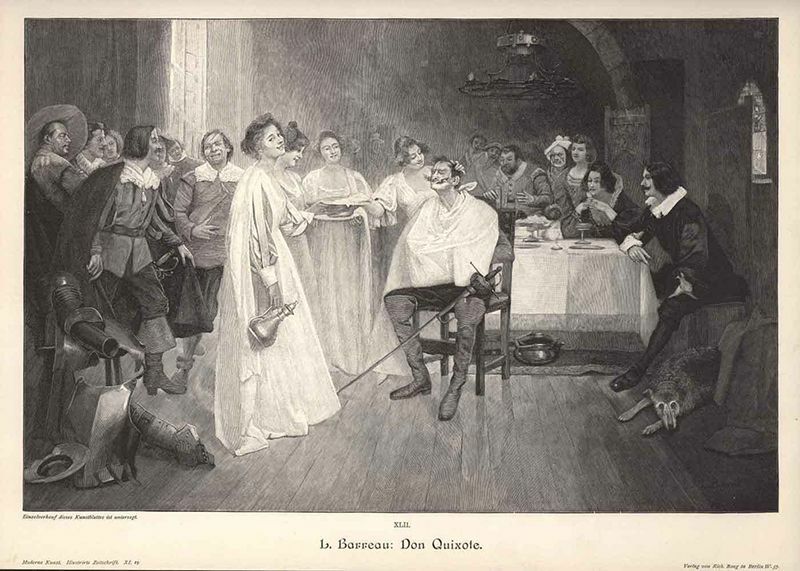 Image size of the engraving is about 13 3/4" x 11 1/5". In the middle of a shave, an old street barber is distracted by a woman in a second story window. 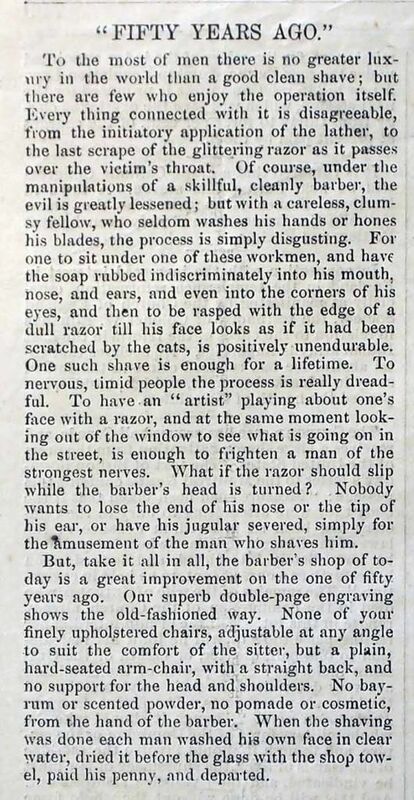 The customer, a strapping man with wavy locks and strong features, continues to hold his crooked expression necessary for the barber to accurately shave his face. A young poor boy, standing next to stacked baskets with leafy greens, watches the going’s on and gives the observer a quick smirk in response to the fuss. Very nice, Ken. Thanks for sharing. Note that in each of the three pieces above there is at least one subject looking back at the viewer: an old lady and a dog (under a chair) in the first, the boy in the second, and the young woman along with another dog in the third. Thanks for sharing! I would prefer the barbers look at ME though when getting that blade close to my neck. (01-03-2015, 05:32 PM)Bowhnter Wrote: I would prefer the barbers look at ME though when getting that blade close to my neck. Comical inattention seems to be a fairly common theme in barber-shop related art. Great pictures Ken! Thank you for sharing. Reading the text accompanying the first illustration offers a connection to a bygone time. Ken, thanks for sharing. Old-time artwork is quite charming. These are really wonderful works of art. Thank you for sharing. Really enjoyed seeing them.